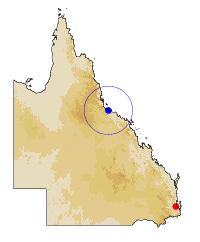 Townsville is the blue dot on this map, slightly north of the half-way point between Brisbane (the red dot) and the tip of Cape York. Queensland is a big place: we are further from Brisbane than Melbourne is from Adelaide or Sydney. The city is home to about 200 000 people. It is a coastal city with a diverse and therefore robust economic base (mining, industry, defence, tourism, primary production, government, education and more) and a flourishing arts scene. For a long time the community consisted of the City of Townsville, established in the nineteenth century and centred on the area between Castle Hill and Ross River, and the City of Thuringowa, a largely-rural local government area which became suburban as Townsville outgrew its boundaries. The two administrations were amalgamated in 2008 under the original name. A quirk of geography means that Townsville is much drier than its neighbour and rival, Cairns, and so attracts fewer tourists; local opinion is divided on whether or not that’s a Good Thing. In any event, our region is defined as “Dry Tropics” and our monsoonal climate means we have dry winters and (if we’re lucky) wet summers; for much more on this, visit the blog – posts tagged “seasonal change”, for instance.